It’s the anniversary of the first appearance of Mickey Mouse, which happened in November of 1928. I have always been a fan of Mickey Mouse as a rat, in particular. 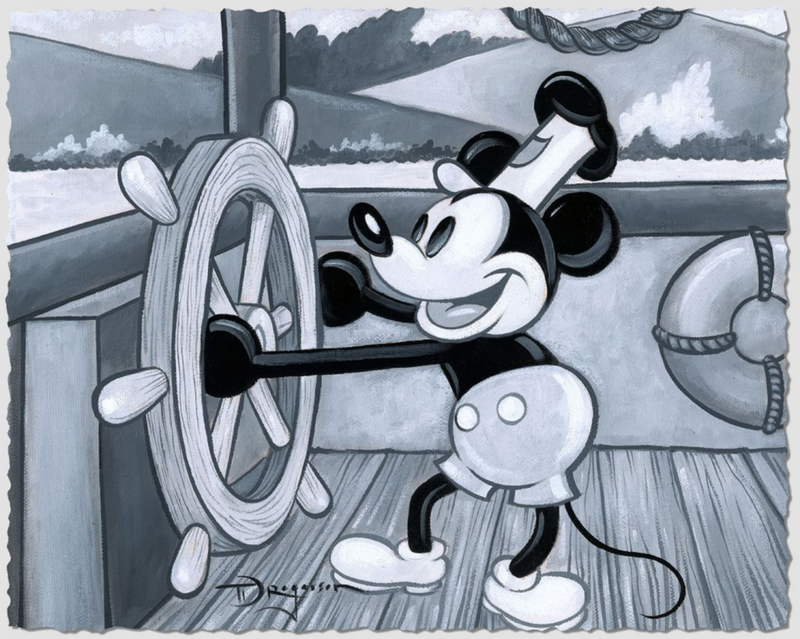 Ub Iwerks made the awesome black and white Steamboat Willie. He had designed the character after having designed Oswald, a character for which Disney lost control. 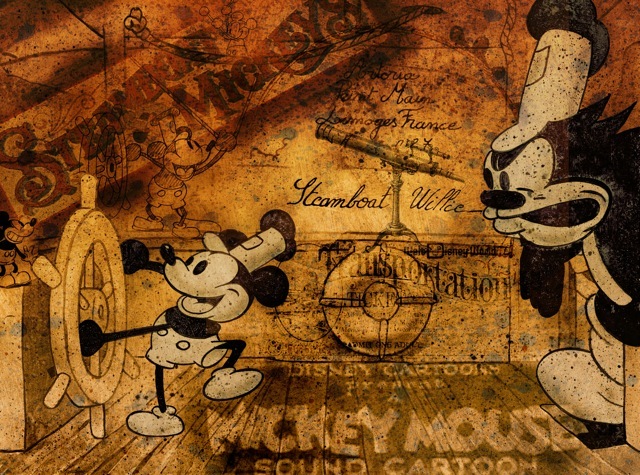 Steampunk Willie by William Silvers celebrates Mickey Mouse’s 90th anniversary perfectly! Ub Iwerks, who is recognized as one of the most influential men in cartoon history, went on to animate my favorite Mickey Mouse cartoon, The Skeleton Dance. In 1938, Freddie Moore, the famous animator known for , redesigned Mickey’s body away from looking as much like what Ward Kimball called Mickey’s “rubber hose, round circle” design, or what made when they used squash and stretch on him look so noodle-like. Mickey’s eyes have changed a lot through the years, but Freddie Moore gave him the smaller white eyes with pupils. You can see the changes in Mickey Mouse from Steamboat to Fantasia to Fun and Fancy Free to Today in Tim Rogerson’s piece Mickey’s Creative Journey. That change had a significant effect, I think, on how connected fans became with the character. You can see that change in design by watching 1938’s Brave Little Tailor, and then 1939’s The Pointer, where the changes had taken place, then to, of course, 40’s Fantasia. You can see he also changed the color of his skin from pure white to a pale flesh tone. The expressiveness of his eyes, with the added pupils and eyelids, has a huge impact on his likability, and the huge following for the Sorcerer’s Apprentice short. It is nearly synonymous with Fantasia. As Moore died in 1952, at the age of 41, his influence over the iconic character is an important part of his legacy. The Mickey Mouse Club tv show, which started in 1955, brought Mickey back into popularity by bringing him into households every week. However, there were no theatrical shorts featuring Mickey between 1953, with The Simple Things, and 1983’s Mickey’s Christmas Carol. The 1983 featurette was the first time a Mickey cartoon had been nominated for an Oscar since 1948’s Mickey and the Seal. Even to this day, a large percentage of the sales through consumer products worldwide is derived from Mickey Mouse merchandise. From our perspective at the gallery, there are a lot of American kids that aren’t fans of Mickey for a whole swath of their teenaged years, unlike Winnie the Pooh. Winnie remains cool, while Mickey goes out of favor until the kids become old enough to have their own children or feel nostalgic about their own childhood. Disney appears to be working to fill that gap by branding the character online and network television in new specials related to the anniversary. On November 4th, there’ll be a program called Mickey’s 90th Spectacular, featuring teen faves like Meghan Trainor and K-Pop powerhouse NCT 127. 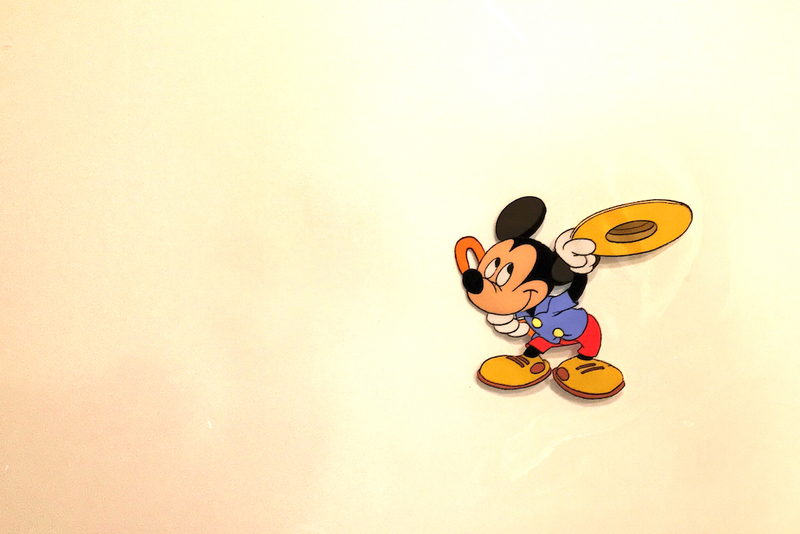 We are lucky to have so much official art of Mickey for fans, created by the artists who actually work in the film industry, as well as production art from the Mickey Mouse Club we just got in. He can be such a charmer! Mickey Mouse continues to be a character lots of collectors clamber for, especially any art depicting Sorcerer’s Apprentice, or with his lady love Minnie Mouse! 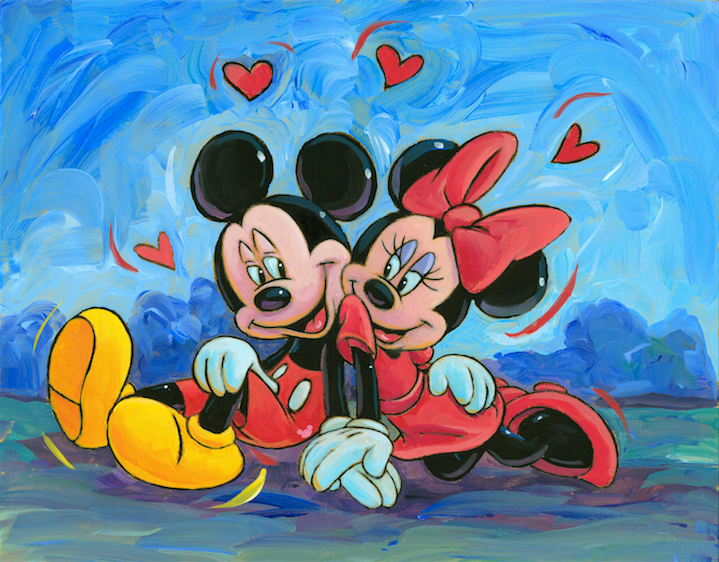 William Silvers, a concept artist who worked on Disney films like Tangled and Lilo and Stitch, and is an official artist for the studio, created this sweet original of the two lovebirds Mickey and Minnie. If you want to see all the options for Mickey Mouse art to celebrate his long and storied career, CLICK HERE. And many happy returns, Mickey. Must be nice to be wrinkle and carefree after all these years!